The Section 809 Panel was established by Congress to address a fundamental problem: The way the Department of Defense (DoD) purchased what it needed to equip its warfighters was from another era — one in which the global strategic landscape was entirely different. Today, the United States’ ability to maintain technological, military, and economic superiority is being challenged because its adversaries are rapidly modernizing their militaries with an eye toward exploiting U.S. vulnerabilities and negating traditional U.S. advantages. Congress became concerned that DoD had not fully adjusted to the pace of this environment, nor had it adjusted to a marketplace that bears no resemblance to that of just a few decades ago. 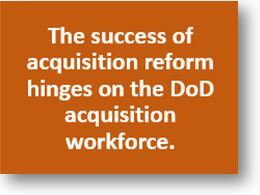 To address the problem, Congress charged the Panel with reshaping the DoD acquisition system into one that is bold, simple, and effective.